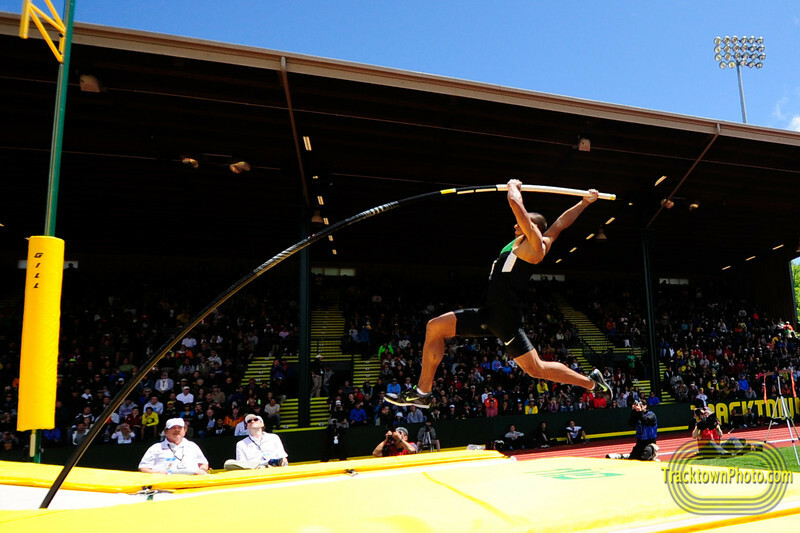 Breaking the Decathlon world record took me completely by surprise. I had no idea I was ready to do it. Sometimes I would think about breaking the world record but I always envisioned it being on my own terms. I thought I would decided the meet and the day and the year that it would happen. I pictured myself being 27-28 years old and going into a meet, maybe Götzis or world champs or the Olympics and I would think "yes, I feel really good. This is the meet I'm going to attempt the world record." But, that's life right? You can plan all you want but right when you think you're in control life throws a little curve in the road just to remind you who is boss. Before the competition I was having trouble sleeping I was so nervous. I would fall asleep dreaming about my events. I would try and have good thoughts but sometimes I pictured myself tripping coming out of the starting blocks in the 100m or fouling all 3 attempts in long jump. My main goal was to make the Olympic team. I didn't care what I scored or what place I got. I had nothing else on my mind going in. I just wanted marks in all of my events and I wanted to be an Olympian. My coach and I set up a plan were I focused on the 100m and the long jump. We thought if I started off good in those events then it would set me up for a good Decathlon both mentally and physically. We would work on them in practice a lot and the few meets that we went to this year I did those events. Well, turns out it was a pretty good plan that worked really well. Again, I had no intentions of breaking any record before the competition. My coach and I didn't even talk about any of them. I knew I felt good but I didn't know what I would do in each event. Well, the 100m started and after my time I started to relax and the rest of the competition is history. I was really relaxed and normal and comfortable the whole competition. I didn't really know what kind of score I was going for but I knew I was on my way to being an Olympian. After the first day I saw my score and knew it was pretty good. I kept asking what Dan O'Brien scored during his first day. I wanted to get as close to 4800 points as possible just because it sounded like a good number to hit. The second day I didn't know I was on pace to break the world record until after the pole vault. 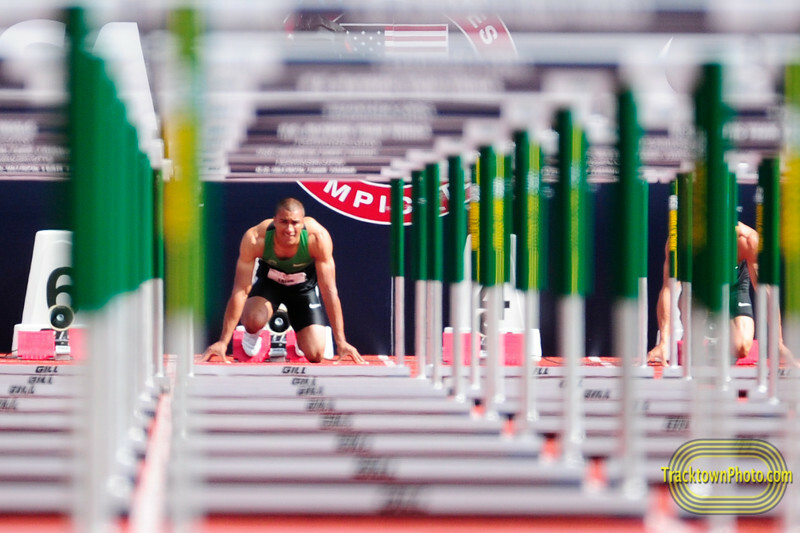 My favorite part of the whole Decathlon came after I finished the pole vault. After I cleared 5.30m I went to the warm up area. My coach met me and said good job and kept telling me about what I need to work on to throw the javelin far. He kept showing me technique and getting excited about it so I started to sense something. I asked him "OK coach, just tell me what I need to do to get the American record." He would talk about how it's been around too long and I thought I was on pace to score 8800 points. But, he stopped what he was doing, looked at me and said "Ashton, not the American record, the world record..." Right then I understood what I had to do. You don't get second chances at world records. After the javelin I knew I had to run 4:16 to get it. Of course I was nervous because I have never run that fast before but I felt like I had no choice. 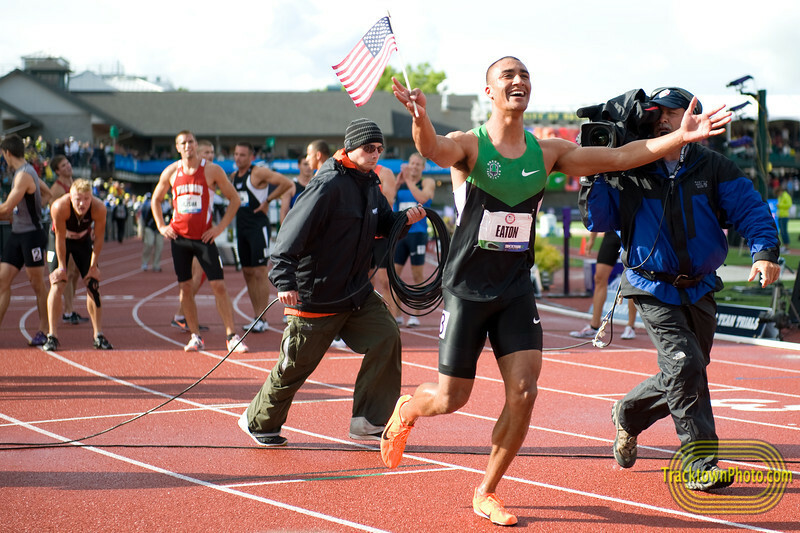 I wanted the recored and I wanted to break it in America and I wanted to break it in Eugene at Hayward field. It's were track became my whole world. As I was running the 1500m the only thing I could hear was the crowd and I could barely hear the announcer through their cheers. With 400m to go I heard him say I was 2 seconds off pace. Right then I new I would get it. The crowd just lifted me. Of course I was tired, but I didn't get more tired. I just stayed the same. I felt like if they kept cheering I could run forever. Going in to the Olympics my coach and I are not going to change anything. Why would we? I'm just excited to get to the Games and compete with my Decathlon brothers. I'm looking forward to he experience and to being a part of Olympic history. 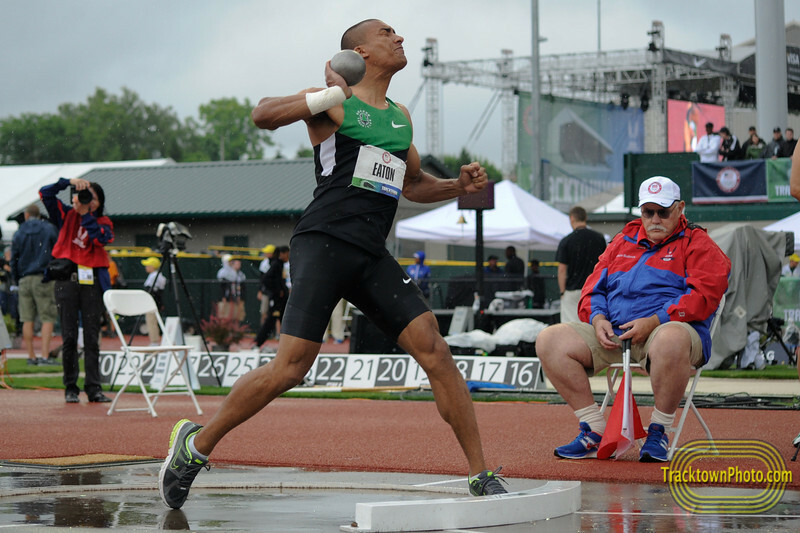 Congratulations, Ashton, on your incredible 2012: seven multievent personal bests (100, long jump, shot put, 110 hurdles, pole vault, javelin, and 1500), a third consecutive world record in the heptathlon (Indoor World Championship, Istanbul), a world record in the decathlon in your hometown under terrible weather conditions (US Championship, Eugene), and victory in the London Olympics. I hope you make this season perfect by winning the IAAF Combined Challenge in Talence on September 15-16. Congrats Ashton, I watched you all the way online and saw everything live. I set my alarm for 4am to watch you streaming live and it was well worth it. You make it look easy and we all know it's not. Trey looked great too. Wish Clay was there for the clean sweep. American dominance, I love it. Good luck in Talence. Here's a ton of congrats to an already huge pile for a WR / OC / WC!! What a crazy Dec @ OR. Hope the focus and drive will stay strong as he must mostly fight himself for now.